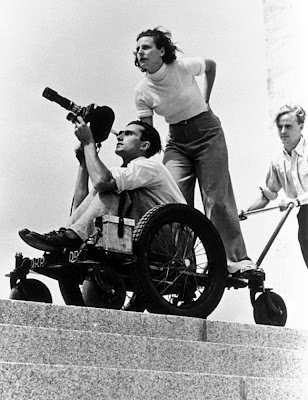 Leni Riefenstahl, directing a cameraman. Leni Riefenstahl began her career as a ballet dancer, until a knee injury forced her to quit. She then became a film actress during the 1920s. In 1931, she set up her own film company. She wrote, directed, produced and starred in a film called The Blue Light, which won several awards. In 1934, Hitler asked her to film that year's Nuremberg Rally. She filmed parades, speeches and presentations by the army and the Hitler Youth. She directed and produced the footage as a documentary called Triumph of the Will. 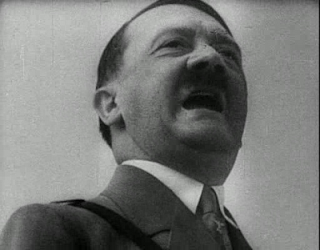 She used a variety of filming techniques, such as panoramic views and low-angle shots of Hitler to create what is considered to be a propaganda masterpiece. The film won many prizes around the world. She also produced Olympia, a documentary on the 1936 Olympic Games which were held in Berlin. Again, she used filming techniques to highlight the Nazi organisation of the event and the role of Hitler. After the Second World War, she was cleared of being a Nazi, as she said she did not understand Hitler's plans and only made films because she was asked to. Nevertheless, Triumph of the Will destroyed her career because of its association with the Nazis. Riefenstahl began a new career as a still photographer. She spent time in Africa photographing the Sudanese Nuba tribe, and she made her first documentary in decades in 2002, about underwater life. She died in 2003, aged 101. An example of Riefenstahl's techniques. make him appear larger than life. Originally a ballet dancer, became a film actress and set up her own film company. Triumph of the Will: 1934 Nuremberg Rally, filming techniques as propaganda. Olympia: 1936 Berlin Olympic Games. Cleared of being a Nazi, but her career was destroyed because of Nazi associations. Became a still photographer (Sudan) and made a documentary about underwater life. 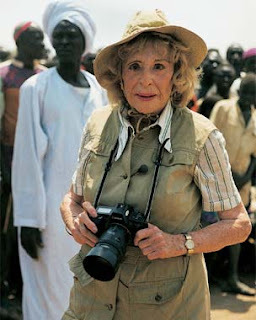 Riefenstahl in Sudan in later years.